Did you know that you can open a bottle of wine by whacking it against a wall? If you've read Lifehacker, you know it's possible. But what about the physics behind this phenomenon? Let's talk about why gas in the bottle pops the cork, even if the alcohol isn't champagne. I know we're all supposed to be wading through a sea of sophisticated yet heart-healthy booze nowadays, but for those of us who don't drink much, something bad happens. Corkscrews disappear. Despite their bulk and odd shape, they slip behind drawers, hide themselves in dishwashers, and just generally get lost in odd-shaped kitchen clutter. That's how I end up buying a lot of corkscrews, but still drinking wine filled with cork bits because I had to hack through the cork with a kitchen knife. Mine is a glamorous life. 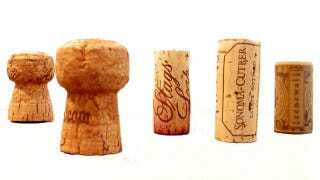 If you're willing to chance an explosion of glass and alcohol, you can find a different way to get a cork out of a bottle of wine. Put the wine in some kind of padding - most people recommend a sneaker - and crack its bottom against a wall or floor until the cork comes out. This actually works, although it seems it shouldn't. The bubble of air at the top of the bottle moves to the bottom of the bottle as it gets accelerated backwards. The sudden, hard strike of the bottle against the wall compresses the bubble of air. One side of it is being pushed against the glass, the other side has the wine pressing against it. The inside volume of the bottle stays the same size, but suddenly the volume of the air bubble plus the volume of the wine is smaller. The wine could probably stand up to a mild vacuum, but the extra volume is filled by dissolved gas bubbling out of the water on the end of the bottle near the cork. Even if it's not champagne, wine, and most liquids, has air bubbles dissolved in it. The creation of the small vacuum pulls them out of the alcohol. This process is called cavitation. Once the wine has hit the wall and rebounded, the bubbles that have just been created are pushed up against the cork. They burst and push the wine cork up and out of the bottle. Repeat this a few times and the cork should shake itself out far enough that it'll be possible to twist and pull it out by hand. The problem? Although wine bottles are strong if they're struck exactly at the bottom, and with enough padding, hit them at an angle or without enough padding and they will shatter in your hand. That's going to be unpleasant for many reasons. Perhaps you can cover up the awkwardness with a lesson on physics, but that rarely works as well as you think it will. Still, if you're adventurous and desperate for liquor, this is the way to go. To be sure, please look at a video of an actual French person opening a bottle "avec une chausseur." They know wine. And shoes.